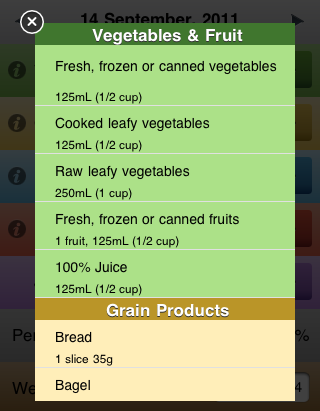 Portions is an app for your iPhone or iPod Touch to help track the food food you eat, based on the Canada Food Guide. Your daily percentage (think of it as a score) is based on how close your consumption matches the daily recommended amounts. 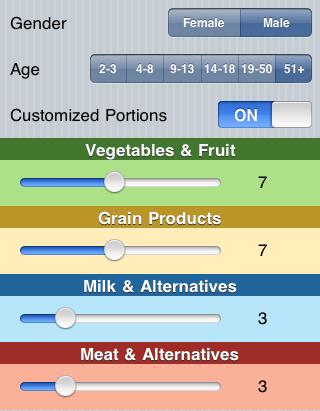 Get Portions for iPhone and iPod touch on the App Store. Quickly enter your daily consumption in the Entry screen. Not sure what constitutes a portion? Look it up here. The Calendar gives a quick at-a-glance view of how well you're doing. 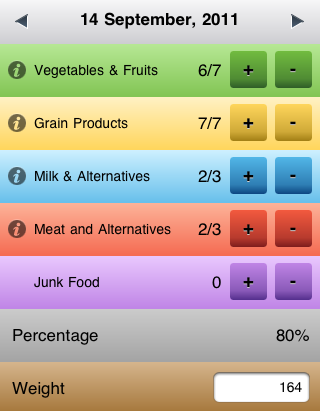 The Chart screen shows a scrollable chart of weight and percentage. Settings are now part of the app. The Guide screen contains a complete copy of the Canada Food Guide. Foods are sorted by group and include portion sizes. The calendar colors each day according to the percentage. The color ranges from red, which indicates a low percentage, through yellow and up to green, which indicates a high percentage. Tap a day to see the score, entries and weight for that date. 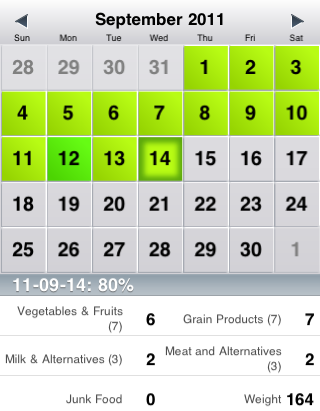 View your "score" percentage and weight over time. The last 90 days of entries are shown. 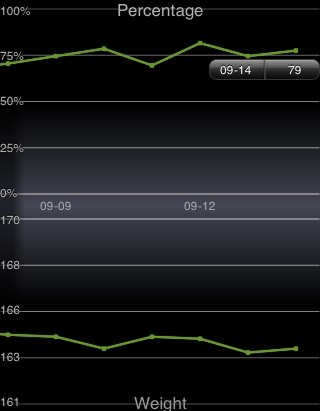 The graph is scrollable and can be moved by dragging it. Recommended daily intake varries based on your age and gender. Be sure to set your age and gender. Portion amounts can be customized.